So you've been asked to lead a quality control initiative? Or maybe you've been assigned to a quality team. Perhaps you're a CEO whose main concern is to make your company faster, more efficient, and less expensive. Whatever your role is, quality control is a critical concept in every industry and profession. 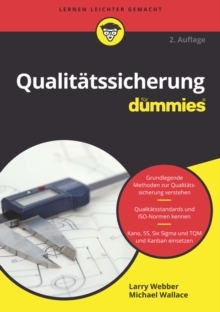 Quality Control For Dummies is the straightforward, easy guide to improving your company's quality. It covers all of today's available options and provides expert techniques for introducing quality methods to your company, collecting data, designing quality processes, and more. This hands-on guide gives you all the tools you'll ever need to enhance your company's quality, including:* Understanding the importance of quality standards* Putting fundamental quality control methods to use* Listening to your customer about quality issues* Whipping quality control into shape with Lean* Working with value stream mapping* Focusing on the 5S method* Supplement a process with Kanban* Fixing tough problems with Six Sigma* Using QFD to win customers over* Improving you company with TOC This invaluable reference is written from an unbiased viewpoint, giving you all the facts about each theory with no fuzzy coverings. It also includes steps for incorporating quality into a new product and Web sites packed with quality control tips and techniques. 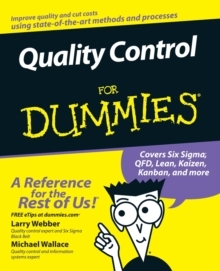 With Quality Control For Dummies, you'll be able to speed up production, eliminate waste, and save money!